BuyYouTubeLikes is an American website which claims to have been around since 2007. They have one of the most extensive collections of services we’ve seen, including Facebook, Instagram, Pinterest, Vimeo, Periscope, Twitter, and more, including the YouTube services this review looks at. The website that all of these services are on looks a little dated, but it’s organized well. They will offer you your money back if they do not deliver the service you pay for. Unfortunately, they state in their Disclaimer that they offer no other warranties. For those who do order, payments can be made through PayPal, Payoneer, Payza, BitCoin, and credit cards. 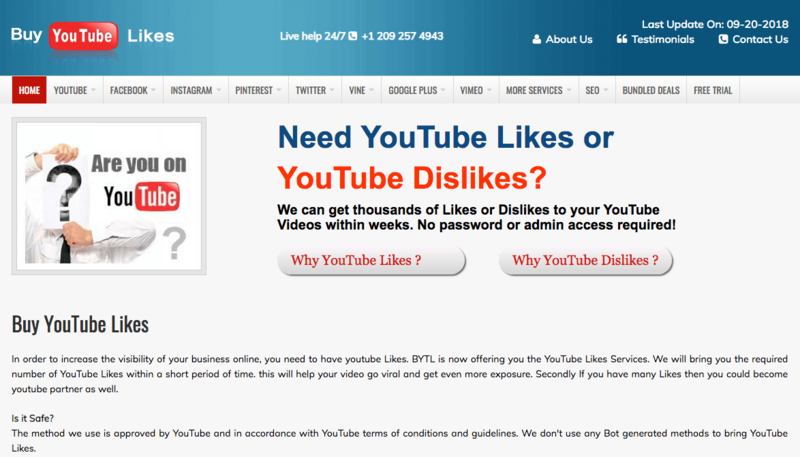 BuyYouTubeLikes heavily promotes their phone number, +1 209 257 4943, for support. 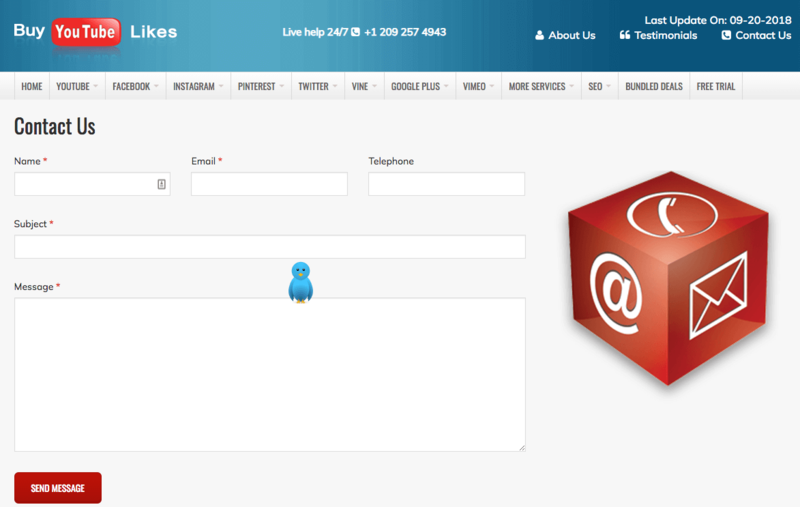 They also have a contact form, as well as a live chat panel which is frequently staffed. While they don’t have a retention warranty, they do invite users to contact their customer support if what is purchased isn’t delivered in full or if the numbers drop below the amount purchased. 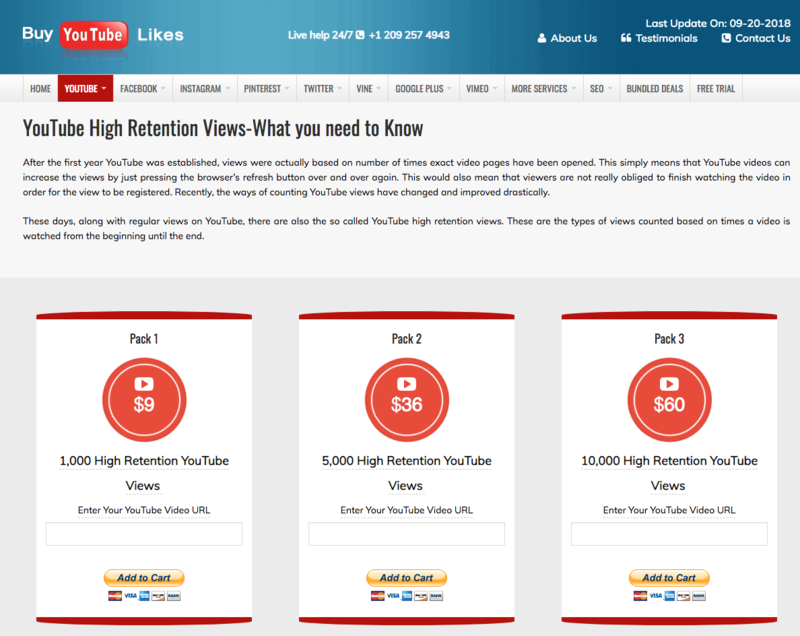 The views which they are selling are claimed to be ‘high-retention.’ This means that the majority of the video you buy views for will be watched through, rather than the first few seconds being watched and then turned off. What we like most about BuyYouTubeLikes is that they are so much more than their name suggests: They can be a one-stop shop for all of your social media needs thanks to their huge inventory. What we don’t like is their lack of consumer protection policies, such as a proper retention warranty and refund policy, and that hurts them as we value you being protected. If they did better with those issues we’d recommend them higher, but for now they remain average. Have you tried BuyYouTubeLikes yourself? Leave you comments below so everyone will know!